Film-Arcade.net: Hoilday Themed Promo for the Upcoming Thriller "The Killing of a Scared Dear"
Hoilday Themed Promo for the Upcoming Thriller "The Killing of a Scared Dear"
A24 recently released a clip for their latest film "The Killing of a Scared Dear. The upcoming thriller stars Colin Farrell, Nicole Kidman, Barry Keoghan, Raffey Cassidy, Sunny Suljic, Bill Camp and Alicia Silverstone. 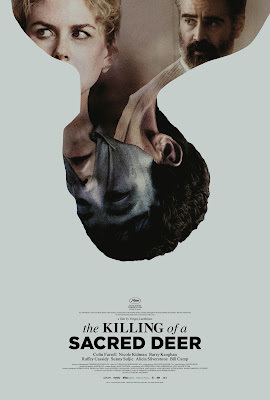 "The Killing of a Scared Dear" hits VOD to own on December 19th and to rent on December 26th. Dr. Steven Murphy (Colin Farrell) is a renowned cardiovascular surgeon presiding over a spotless household with his ophthalmologist wife Anna (Nicole Kidman) and their two exemplary children, 12-year-old Bob (Sunny Suljic) and 14-year-old Kim (Raffey Cassidy). Lurking at the margins of his idyllic suburban existence is Martin (Barry Keoghan), a fatherless teen who Steven has covertly taken under his wing. As Martin begins insinuating himself into the family’s life in ever-more unsettling displays, the full scope of his intent becomes menacingly clear when he confronts Steven with a long-forgotten transgression that will shatter the Murphy family's domestic bliss.